I don’t know if I’m just getting grumpy as I age, or if scars that continue to build up are getting to me. I’m talking about the scars associated with hearing about another cancer diagnosis for another loved one and the fear associated with this diagnosis. I am a very optimistic person (that usually has reality warming my backside). I tend to latch onto things that give me hope. I latch on to positive indicators that things can get better. I also (especially as I get grumpier) expect to see results, progress, and a payback for the time, energy and money that we are spending on cancer research. After having been associated with Roswell Park Comprehensive Cancer center for over twenty years now I can tell you that they continue to be the beacon that is my light at the end of the tunnel. Under the leadership of Dr. Candace Johnson not only are they making advances and bringing real solutions to patients around the world, they are accelerating the rate at which they do so. Accelerating the rate of delivering real solutions to cancers is only possible by expanding the sources of revenue to fund existing and new programs. 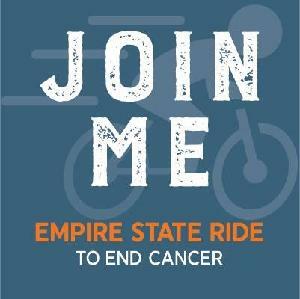 For every dollar we raise from the Empire State Ride, we will be able to get an additional thirteen dollars in grants. That is a pretty good return! Thank you in advance for your support on our 2019 Journey from the Statue of Liberty to Niagara Falls. Carrying the beacon of hope across the beautiful State of New York. No donation is too small, and every dollar adds up to something greater than any one of us could accomplish alone. Merry Christmas Dad!! From all of us!